Hair care for dry hair. Handmade with natural ingredients and fragranced with essential oils, approved by the Vegan Society. Hairy Jayne isn't actually hairy! She's a hairdresser (with lots of hair) who listens to her clients about their one biggest hair problem – dry hair. All of Hairy Jayne's products are designed to be nourishing, moisturising or protecting. All are packed with ingredients derived from nature, fragranced with essential oil blends, are highly biodegradable, paraben free and 100% cruelty-free. Hair Perfume with Heat Protection protects wet hair from heat when blowdrying and adds freshness and shine to dry hair whenever it needs it. If you find washing your hair a pain-in-the-neck, or if frequent shampooing is drying your hair out or stripping the colour, this is for you! Not just a perfume, it adds shine, calms frizz and protects your hair from heat – all in one spritz. Citrus fragrance made from a blend of Grapefruit, May Chang & Jasmine. I always forget to use heat protection on my hair, so when I came across the lovely looking Hairy Jayne Citrus Hair Perfume & Heat Protection on LoveLula.com, I thought it would make me remember! I really love that this product comes in a glass jar and not a plastic bottle. Unfortunately, I'm not too keen on the scent of this product but I love the fact that it does its job by protecting my hair from heat. It also works really well when my hair needs a little freshen up if there's no time to completely wash it. Overall, I'm definitely looking forward to trying the other scent of this product which might be more to my liking. The Ekah Foundation is a social enterprise. Founded in 2016. Its focus is on Health and Wellbeing. The products we sell are vegan, cruelty-free, natural, fair trade and ethically produced and sourced from poor communities we support in India. The other strands of work we do are in education and empowerment. We deliver a range of self-development courses both online and to community groups. We also work with individuals, families and businesses to help them achieve their potential. We specifically work with vulnerable people. All our profits go to support our animal sanctuary. Pashupati Animal Sanctuary is situated in the Rossendale Valley and is home to over 30 animals. The sanctuary provides food, shelter, vet nary care and love to the animals who are free to live a long and happy life. The animal sanctuary has been running since 2007, where it began with the rescuing of Lotus our racehorse. It relies on sponsorship and fundraising. At the animal sanctuary, there are also environmental projects, for example, the planting of 6000 trees, and the cultivating of area’s for insects and wild rabbits and foxes. 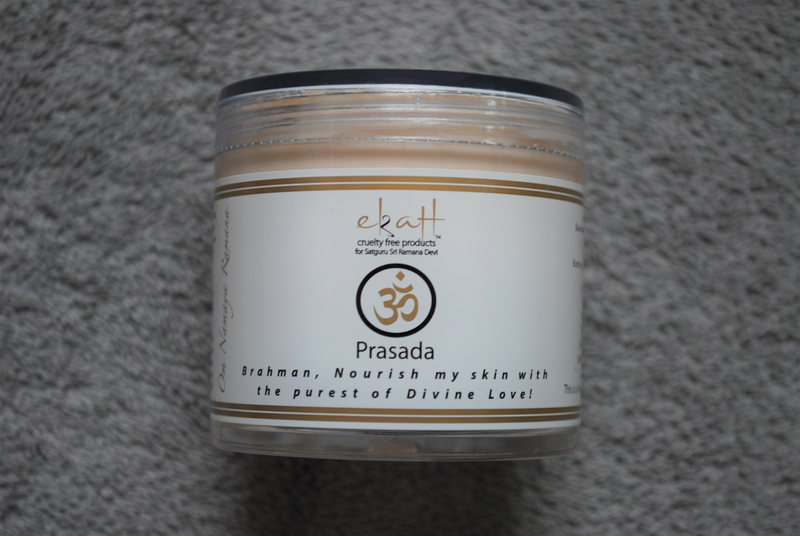 I was kindly sent this Prasada Moisturising Cream from ekaH to review for them after Helen had contacted me via email. I accepted to review the product as I loved the background of ekaH and the moisturising cream sounded great. Firstly, I absolutely love the scent of this cream it smells amazing. I'm not sure as to whether the cream is meant for your body or your face... Personally, it would be too heavy for me to use on my face due to my oily skin, but I've found it's great to use on my legs. Due to the cream being super thick and creamy my legs are left feeling really soft and hydrated after use. And the amazing scent lingers throughout the day which is an added bonus for me! When it comes to the packaging, I personally feel that a glass jar over the current plastic one would look a lot better and would finish off the classy look of the product. Overall, this is a great moisturiser that I can't stop smelling! This magical combo can do no wrong! Fresh, bright blueberries whisked together with tart, Meyer lemon, pure bliss! Super moisturising with shea butter and jojoba oil. 100% natural, Vegan, Certified Cruelty Free. I'm a big fan of lip balms and the other day I actually fully used one up! When I found this Blueberry Lemon Crazy Rumors 100% Natural Lip Balm on LoveLula.com I definitely had to try it out as it sounded amazing. For some reason, I don't think I've had a blueberry muffin since going vegan and this lip balm smells exactly how I remember blueberry muffins to be, super sweet and moreish. Due to their extensive range of amazing scents, Crazy Rumors Lip Balms are probably the best vegan lip balms out there. My lips are left feeling really soft and super hydrated after use which is why I love using their lip balms throughout my day. Soften and smooth hard skin with this zesty moisturiser for the feet. Fairtrade Argan Oil from Morocco. Vegan, Fairtrade and Natrue certified. I came across this Fair Squared Lime Foot Fresher on LoveLula.com whilst on the hunt for a new foot cream to replace my old one. After having a shower, I really like to moisturise my feet to keep them hydrated and soft skinned. This foot cream soaks in really well and leaves my feet feeling super soft after use. The scent is light and refreshing which will be perfect for the Summer. For me, the cardboard box that the bottle comes in isn't really needed as it causes more waste. And I would prefer a pump for this bottle or a pot of the cream to make use a little easier. Overall, this is a great foot cream with great ingredients.